The Y Heroes joined together on stage at the Rhode Island Convention Center in Providence, RI. 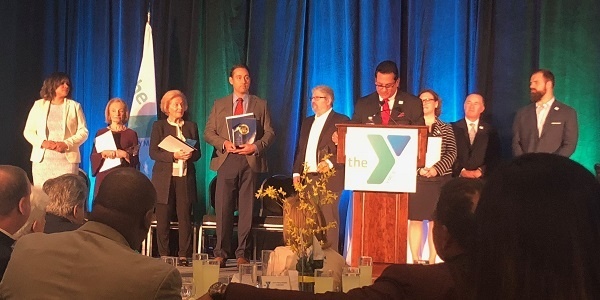 YMCA of Greater Providence CEO Steven O'Donnell welcomed attendees at the Rhode Island Convention Center on Thursday afternoon and shared his experience leading the organization in a direction that strengthens communities through youth development, veteran support, and healthy living. The Baker Family was honored for their longtime commitment to the Newman YMCA. Michael Baker accepted the Y Heroes award on behalf of his family on April 12th. The Baker family’s deep roots in the YMCA organization is the result of three generations of commitment to the community. George K. Baker Sr. was a board member of the Greater Providence YMCA and a founding father of the Newman YMCA, raising double what was required to begin construction on the donated land in Seekonk, Massachusetts. His son, George “Buddy” Baker was a board member of the Greater Providence YMCA before joining the board of the Newman YMCA, supporting the organization through Road Races and beginning a golf tournament with his friends to raise money for the YMCA in the 80s. Influenced by his family, Michael joined his grandfather and father visiting the YMCA as a child and his relationship with the organization grew as he grew older; following in his family’s footsteps as an active supporter the YMCA and eventually working there as a young adult. Inspired by his father and grandfather’s involvement with the YMCA throughout his life, Michael became the chairperson for the annual George K. Baker Golf Tournament. Now in its 25th year, the tournament honors George Sr.’s instrumental role in the Newman YMCA’s growth over the past 30+ years. Buddy and his friends raised just $800 in the early years of the tournament and since then the tournament continues to grow allowing the Newman YMCA to provide financial assistance to those in need. 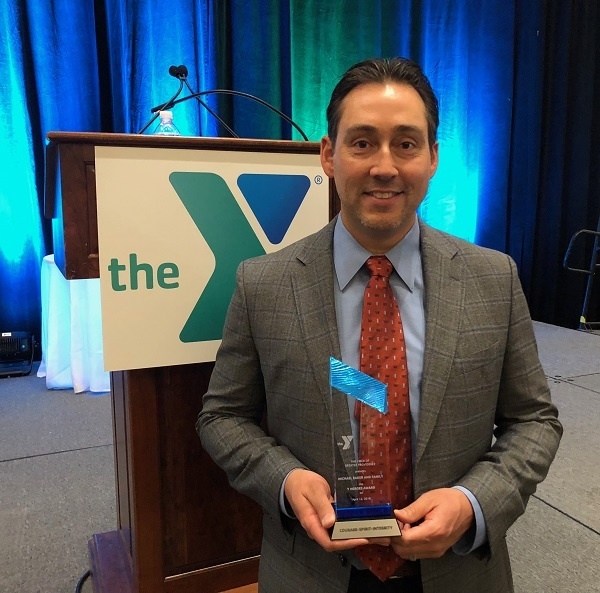 Michael was named the YMCA of Greater Providence Volunteer of the Year in 2010, continuing the Baker family’s legacy as lifelong supporters of the YMCA. Others honored at the event were Lammis Vargas for her volunteer work at the Cranston, Rhode Island, YMCA; Ellen Collis and Gloria Hall for their efforts behind the renovation of the Bayside YMCA in Barrington, Rhode Island; and the Ocean State Job Lot Charitable Foundation, which continues to distribute tractor-trailer loads of food to organizations that help those in need across the Northeast. Proceeds from the event will help fund the 'Supporting Those Who Have Served' program. The mission of the program is to give YMCA memberships to local veterans and their families who might not otherwise be able to afford club access. A portion of funds raised will also support the Steven O'Donnell Scholarship Fund to support families with the costs of YMCA camps and services.